In 1812, the salamander-shaped district that Massachusetts Gov. Elbridge Gerry configured for a legislative election led to the composite term “gerrymander” as a synonym for drawing politically motivated voting districts. This caricature of a map first appeared in the Boston Gazette for March 26, 1812. Brian Cannon has put more than 23,000 miles on his tan Tacoma pickup truck traveling around most of Virginia’s 99 counties, preaching the gospel of redistricting reform. It’s not the kind of headline-grabbing topic that naturally lends itself to the level of grassroots engagement needed to foment political change. But Cannon is a true believer, so spread the message he will. “We've got to end gerrymandering to have better politics in Virginia and in our country,” declares Cannon, who credits Sen. John McCain with lighting his fire for fairness in politics when the Arizona Republican made campaign finance reform a signature issue during the 2000 presidential race. Cannon is executive director of the advocacy group OneVirginia2021: Virginians for Fair Redistricting. With members from across the political spectrum, the group wants a deceptively simple sounding solution to an entrenched political issue: a constitutional amendment that would put a commission in charge of drawing legislative boundaries instead of the politicians who benefit from it and who currently get to decide where those districts lie. The mission is to end gerrymandering in Virginia, the state where the practice began and which has become one of the most gerrymandered in the nation. Once-red Virginia has been turning increasingly purple for several election cycles – going for Democrat Barack Obama in 2008 and 2012, then for Democrat Hillary Clinton in 2016. The same holds true for the U.S. Senate seats, which have both been Democratic since 2008. But when it comes to U.S. House and state legislative seats – the ones where how the districts are configured matters to the outcome -- Republicans have largely remained in control in recent years. The congressional delegation is currently comprised of seven Republicans and four Democrats. OneVirginia2021 highlights the 2013 general election outcome to illustrate the level of gerrymandering. That year, 56 candidates for the House of Delegates’ 100 seats had no major-party challenger -- 22 Democrats and 34 Republicans. Of the remaining 44 races, only 19 were considered competitive to some degree. When the votes were tallied, just two seats had changed parties. In the November 2017 election, the situation played out differently. This time, the number of uncontested races dropped to 33, with 23 Democrats and 10 Republicans facing no challenger. The anti-Trump backlash at the polls led to 15 seats changing parties – all flipping from Republican to Democrat. But Cannon and other reform advocates are quick to point out this is not a partisan issue, and both parties are guilty of gerrymandering. The current partisan split simply illustrates how gerrymandering works – even as more Virginians have been voting Democratic, the congressional delegation and General Assembly have remained under Republican control. That, reformers contend, is what happens when politicians pick their voters through the redistricting process rather than voters picking their leaders through the election process. Educating the electorate about gerrymandering was Cannon’s mission in Waynesboro, a modest sized town nestled in the heart of the Shenandoah Valley, on a Tuesday night not long after the November statewide election in Virginia. About four dozen people turned out at the historic Wayne Theater, an old vaudeville house that’s been restored to a performing arts center. They’d come for a movie night. OneVirginia2021 produced an hour-long documentary called GerryRIGGED: Turning Democracy On Its Head. The film features a litany of Virginia politicians. Among them are former Virginia congressman George Allen, a Republican who went on to serve as governor and U.S. senator, and former state Rep. Ward Armstrong, a Democrat who spent 20 years rising to leadership in the House of Delegates. Each was ultimately redistricted out of his seat when the opposing party controlled the process. “When we started this effort, gerrymandering was not the buzzword of the day that it is now,” Cannon told the crowd, explaining the history of his group that began with a 2013 meeting of “concerned citizens” in Charlottesville. The group now has more than 70,000 supporters in its database. The film was released in October 2016, aired on PBS affiliates throughout Virginia, and has since been screened more than 90 times across the state. Cannon and Oglesby told the crowd about steps they could take as volunteers. But it’s really that knowledge about the redistricting process that Cannon and Oglesby wanted people to take from the film and then share with their friends and neighbors. They believe it’s going to take a groundswell of public support to achieve the group’s ultimate goal -- an amendment to the Virginia Constitution establishing an independent commission to draw political districts after the 2020 census. More than a dozen other states already have redistricting commissions in various forms, most notably California, where voters approved the plan. But Virginia voters would need to pass what’s called a legislatively referred constitutional amendment. Under the Virginia Constitution, that’s a multi-stage process that requires approval by the General Assembly in two different legislative sessions. The first stage of the process would come about a year from now, when the General Assembly would need to pass the measure in its 2019 session, before the November 2019 elections for House of Delegates. Then the new General Assembly would need to pass the identical measure in its 2020 session. Once that happens, the amendment would be on the November 2020 general election ballot. That’s a difficult task, but not impossible, acknowledges Cannon, who points out that constitutional amendments regularly appear on the statewide ballot. The political uses of redistricting date back more than two centuries, having gotten their start with the very first election of representatives to Congress. So to examine the history of gerrymandering is to walk through the history of the nation and, specifically, Virginia. There are few, if any, issues more fundamental to the nature of democracy than who should cast votes for their leaders -- which voters, in which places, for which candidates. The Founding Fathers understood this and sought to address it. In 1787, the members of the Constitutional Convention wanted to establish a balance, as well as a link, between taxation and representation. Thus was born the concept of apportionment: “Representatives and direct Taxes shall be apportioned among the several States which may be included within this Union, according to their respective Numbers,” states Article 1, Section 2. The concept is to align congressional district boundaries so that each member of Congress represents approximately the same number of people, a number that has grown steadily since the original goal of one representative per 30,000 citizens. Ultimately, Congress had to cap its membership at 435 in 1929 to keep its size from becoming unworkable. In 1788, those earliest voters of the new country went to the polls to elect the first Congress. With that initial election came the first of many efforts to use the boundaries of voting districts to gain political advantage when Patrick Henry – then Virginia’s first governor -- manipulated the lines of the state’s 5th Congressional District in an unsuccessful effort to prevent the election of his adversary, James Madison, to the U.S. House. In 1812, the salamander-shaped district that Massachusetts Gov. Elbridge Gerry configured for a legislative election led to the composite term “gerrymander” as a synonym for drawing politically motivated voting districts. 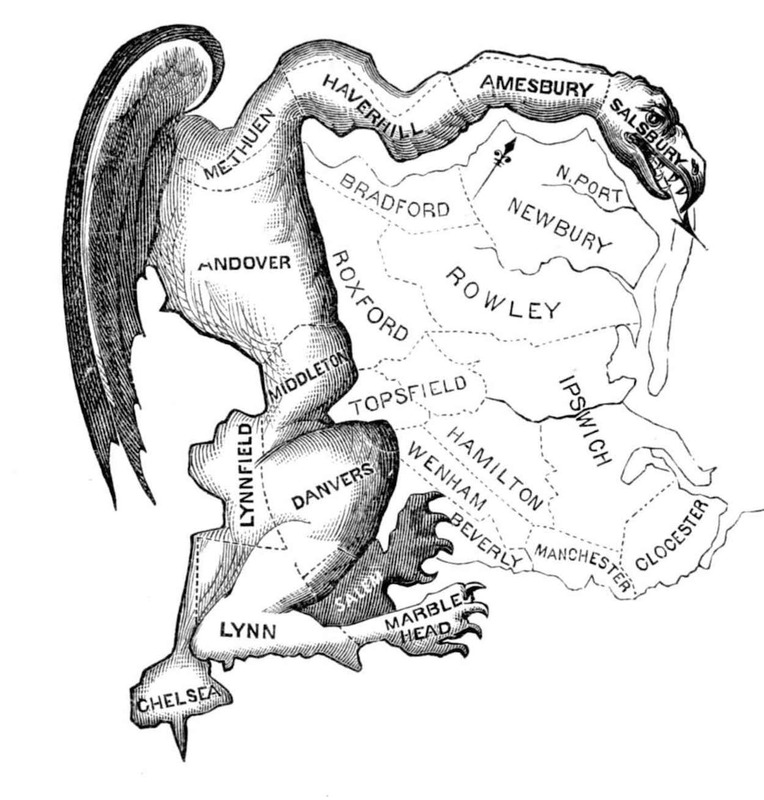 The Boston Gazette published a caricature depicting the “horrid monster” that the gerrymandered map represented. It took a long time for the courts to step into the “political thickets” of redistricting, as Justice Felix Frankfurter once characterized it. In the 1960s, during the era of Chief Justice Earl Warren, the U.S. Supreme Court issued a series of landmark rulings, striking down redistricting plans from Tennessee, Georgia and Alabama. The Warren Court’s rulings allowed voters to challenge redistricting plans on partisan -- in addition to racial – grounds, establishing the one-person, one-vote standard. Warren believed these redistricting decisions, particularly Baker v. Carr, were the most important cases during his 16 years as chief justice – even more than other landmark cases, including Brown v. Board of Education or Loving v. Virginia. To examine the history of gerrymandering is to walk through the history of the nation and, specifically, Virginia. There are few, if any, issues more fundamental to the nature of democracy than who should cast votes for their leaders -- which voters, in which places, for which candidates. “If everyone in this country has an opportunity to participate in his government, on equal terms with everyone else, and can share in electing representatives who will be truly representative of the entire community and not some special interest, that most of the problems that we are confronted with would be solved through the political process rather than through the courts,” Warren said in a 1969 interview. Although both parties have used redistricting to their advantage, Republicans have had the upper hand since 2010. They hold the majority in 32 state legislatures, while Democrats hold 14 states. The others are split or nonpartisan. A study by the Brennan Center for Justice at New York University School of Law underscored the impact of one-party control. By analyzing elections in 2012, 2014 and 2016, the center found “extreme partisan bias” in congressional maps drawn after the 2010 census. Courts across the country continue to be involved in redistricting litigation. Currently, lawsuits are underway in seven states, including Alabama, Georgia, and North Carolina, where both partisan and racial gerrymandering cases are active. Some of these pending cases could affect the voting districts involved in the 2018 elections, according to the Brennan Center. In North Carolina, the tumultuous redistricting process is temporarily on hold after the latest round of judicial intervention. On Jan. 8, a panel of federal judges struck down the state’s congressional maps, saying Republicans were “motivated by invidious partisan intent” -- marking the first time a federal court rejected a congressional map because of partisan gerrymandering. But 10 days later, the U.S. Supreme Court issued a temporary stay of the lower court’s order, pending the outcome of other cases currently being considered by the high court. That means the the maps that will be used in this fall’s midterm elections in NC could remain the same. In Virginia, meanwhile, two redistricting lawsuits are currently working their way through the courts, including an appeal before the Virginia Supreme Court backed by OneVirginia2021. The lawsuit challenges the General Assembly’s 2011 drawing of 11 House and Senate legislative districts as unconstitutional. In their opening brief filed in December, attorneys for the citizens behind the lawsuit argued the General Assembly “flouted” the requirement that voting districts be “compact” as a way to “artfully craft districts that allowed legislators to pick their voters” and increase their odds for reelection. But a landmark case now before the U.S. Supreme Court has the potential to change the outcome for the cases pending in Virginia, North Carolina, and other states. In October, the justices heard arguments in the Wisconsin case of Gill v. Whitford about whether partisan gerrymandering can be identified and whether it’s unconstitutional. That ruling will come by the end of the current term. However the justices rule, it could have a widespread effect on how state and federal legislative districts are drawn, which in turn can determine the party with the most political power. But the consequences will be particularly momentous if the court rules that partisan gerrymandering is unconstitutional. Those are the type of concerns about the state of American democracy that brought supporters of OneVirginia2021 to Alexandria’s Market Square on the sunny Saturday before Thanksgiving. They stopped shoppers browsing the farmers’ market to ask whether they’d sign a nonbinding petition encouraging lawmakers to support the constitutional amendment. “Do you care about gerrymandering?” Amanda Hazelwood, a resident of the historic city that sits just across the Potomac River from Washington, politely asked passersby. Nationwide, there have been many efforts to reform redistricting in addition to the court cases. In 2017, nearly 150 bills were introduced at the state level to address the issue, and about 10 bills related to redistricting were introduced in the U.S. House of Representatives. There are also at least eight states with citizen-led reform efforts, including Virginia, which has the most significant effort currently underway among southern states. Jane Fullerton Lemons is a freelance writer based in Northern Virginia. She has lived in Missouri, Arkansas and Virginia, writing about people, politics and culture along the way.